What is the Eindhoven Peace Path? The Eindhoven Peace Path is a footpath in the Meerlandpark that highlights the themes World Peace, Sustainability and International Solidarity. The Peace Path consist of eight components that each address a different aspect of peace. These “building blocks for World Peace” insipire and symbolize interpretations and visualizations of “Paths towards Peace”. The ultimate goal is to create a worldwide network of peace paths and peace gardens. All of them combined would turn the whole world into a peaceful garden. Our society is under a lot of pressure. There are too many conflicts int he world, and there is too little solidarity, tolerance, and mutual understanding. The Eindhoven Peace Path is a place where visitors will have the opportunity to become aware of the many aspects and conditions for peace and a sustainable world. Within the green environment of the Arboretum (collection of trees), the Eindhoven Peace Path provides peacefull spots for experience, contemplation, relaxation and recreation. The Eindhoven Peace Path encourages encounters of people from different cultures and backgrounds. The path also forms a stage for information and consulatation and for activities such as conferences, music, mediation, meditation, sports and co-operative games. Where is the Eindhoven Peace Path? 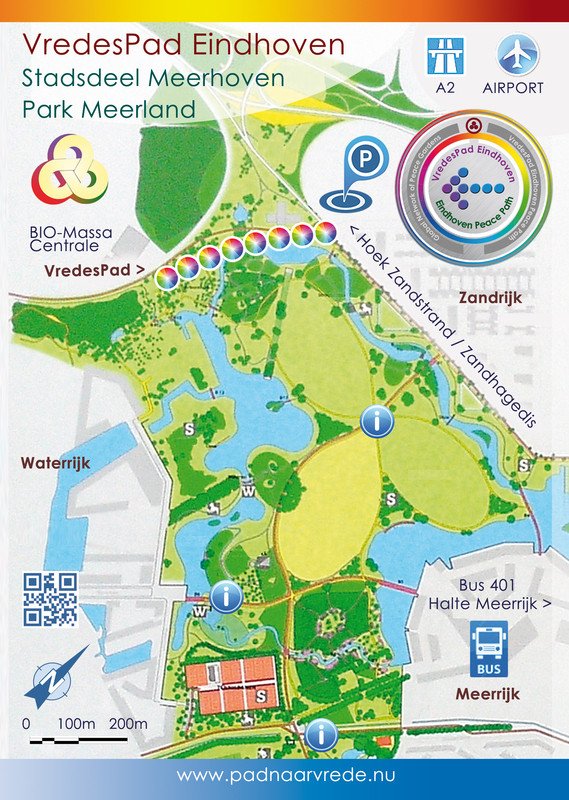 The Eindhoven Peace Path is located in the Meerland Park, district Meerhoven, near Eindhoven Airport. The Meerland Park has a turbulent history. In this location there used to be the military airport Welschap. Right where the Eindhoven Peace Path starts today, there were the landings strips for fighter planes in World War II. The Meerland Park was developed in recent years. The park is inspired by the English landscape and garden style. In 2011 the park was awarded with the Dirk Roosenburg price for architectural and urban plans. World Peace and the Peace Path take some effort to be found. To assist you in doing so, we have these two maps for you or simply click this link to Google maps. When will the Eindhoven Peace Path be built? The first steps in realizing the Eindhoven Peace Path have been set. In 2012 the then alderman Mary Fiers planted the Peace Tree. 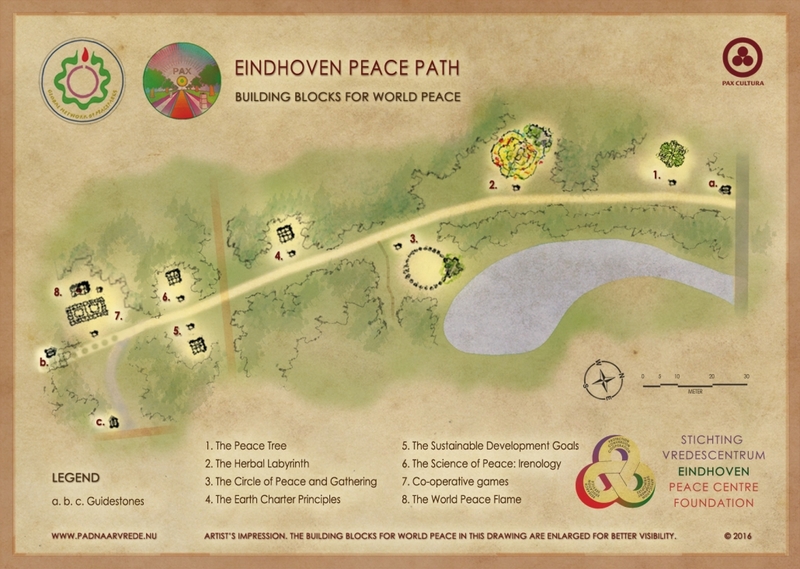 In 2014 the Municipality of Eindhoven issued a construction permit to built the next 7 components of the Peace Path. From 2018 onwards the Peace Path will be developed in phases. In 2017 the logo-discs were placed on the peace-rocks. Also a small test garden was planted at the site of the Peace Labyrinth. 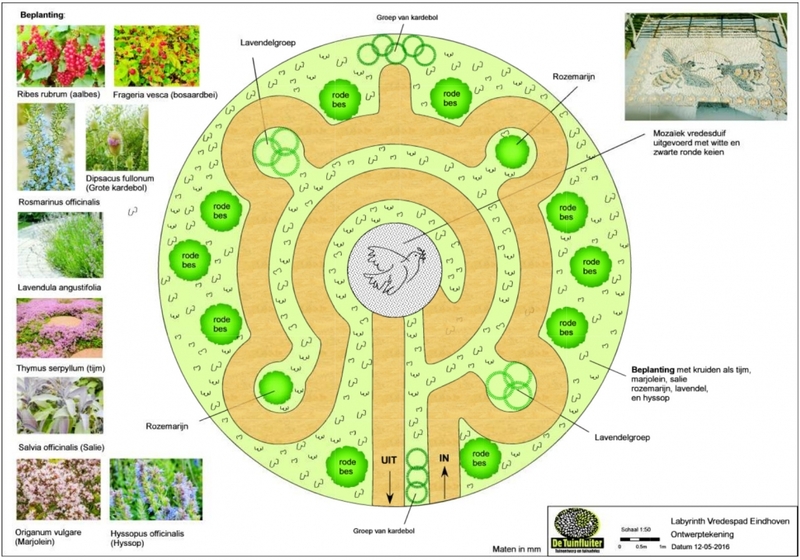 In march 2016 the Circle of Peace was built in cooperation with the Natuurwerkplaats Meerhoven. In 2014, the Municipality of Eindhoven issued a construction permit to built stone monuments along the Eindhoven Peace Path. In 2012 the then alderman Mary Fiers planted the Peace Tree. In 2010, the Municipality of Eindhoven allocated a footpath in the Meerlandpark as the Eindhoven Peace Path. In 2008, VredesCentrum Eindhoven Peace Centre foundation, initiator of this project, was established. In 1988 at the University of Technology Eindhoven the Steering Committee Peace Centre was established. 20 years later this organisation evolved into the Eindhoven Peace Centre Foundation. How will the Eindhoven Peace Path be realized? Sustainability is key in realizing the Eindhoven Peace Path. The structures along the path will be constructed with Ardennes Grey Rocks that were excavated just across the border in Belgium. In the Meerlandpark, many structures have been built using these rocks. In a depot near the park are more rocks waiting to be used to construct the Eindhoven Peace Path. Because of the short transportation distance, the environmental impact will be very low. further, these rocks are extremely durable and weatherproof. The structures along the Peace Path will last for centuries to come. The construction will be done by a local contractor in such a way that during the building activities, the CO2 emission will remain as low as possible. By joining forces with the Natuurwerkplaats Meerhoven that planted an Arboretum (museum of trees) along the Peace Path, the whole project becomes Carbon-Neutral, because the trees compensate for the carbon emissions of constructing the Eindhoven Peace Path. The component “The Harmonious Landscape” offers local residents, contributors and supporters the opportunity to built a piece of the Peace Path together. By planting flowers and herbs together, they can contribute to the realization of the Eindhoven Peace Path. To complete the project additional financing is needed. The initiator of this project, the Eindhoven Peace Centre Foundation, calls for contributors, donors and supporters. Within the organization itself, there are several interesting tasks and positions available for enthusiastic volunteers. For whom is the Eindhoven Peace Path meant, who created the plan, and who is making the designs? 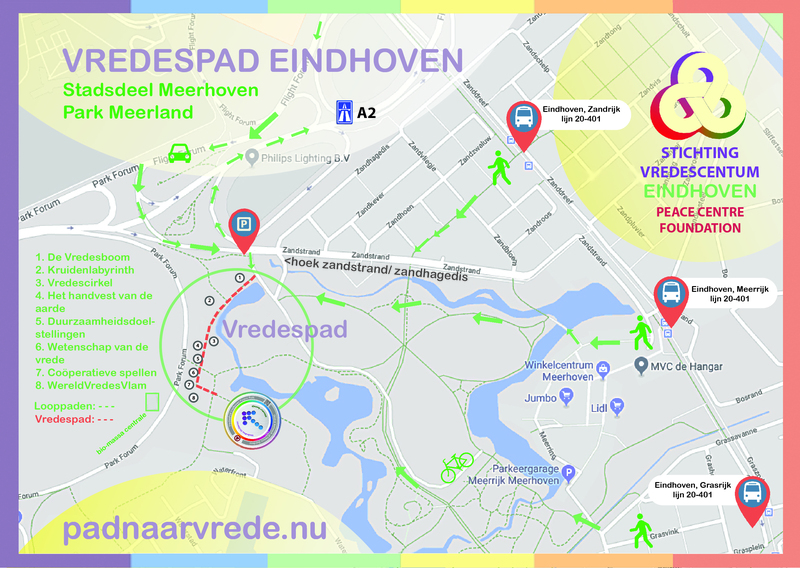 The Eindhoven Peace Path is there for you! And for your friends, family, colleagues acquaintances and for every person, regardless of age, race, religion gender or nationality. The ultimate goal is to create a worldwide network of peace paths and peace gardens. All of them combined would turn the whole world into a peaceful garden. The Eindhoven Peace Path was initiated by the Steering Committee Peace Centre of the University of Technology Eindhoven. In 2008 this organisation evolved into the Eindhoven Peace Centre Foundation. The plan was imagined by architect prof. dr. Peter Schmid, emeritus professor, chairman of the foundation. His device is RED: Research Education Design in Science Art Technology for Peaceful Sustainable Development. Starting with 2017, each year a winning design will be chosen and realized along the Eindhoven Peace Path. In this way, artists and designers are stimulated to contemplate on the theme of Peace and they will be provided with a stage to present their work to a wide audience. 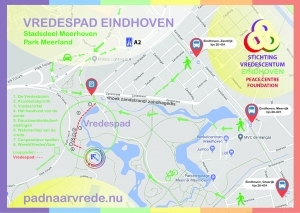 The Eindhoven Peace Path is made possible by the efforts and support of The Province of Noord-Brabant, Municipality of Eindhoven, Association of Local Residents Meerhoven, Vredesburo Eindhoven, Museum voor Vrede en Geweldloosheid en de Natuurwerkplaats Meerhoven. In 2012 the Peace Tree was planted by the then alderman Mary Fiers. It is a tree of the species Ginkgo Biloba, also known as Maidenhair tree or Japanse nut tree. The Ginkgo Biloba is a symbol of hope, love, magic, timelessness and longevity. The Maidenhair tree has inspired many artist, among which is Goethe. The leaves can be used to make tea and extracts of the Ginkgo Biloba are sold in health stores as nutritional supplement. A harmoniously sculptured circle that is richly planted with flowers and ecological herbs symbolizes the constructive forces of nature. Flowers and plants are by gravitation and vigor always optimizing and ecologically inspiring for a dynamic and peaceful balance. They also form a feast for bees, butterflies and insects such as lady bugs. The small labyrinth invites you to walk and contemplate amidst the flowers and herbs. The deisgn is made by Claudia Stold from Buro De Tuinfluiter in consultation with the Eindhoven Peace Centre and the Natuurwerkplaats Meerhoven. In march 2016, the Cirle of Peace was built in cooperation with the Natuurwerkplaats Meerhoven. The Circle of Peace offers lots of opportunities to celebrate local peace and world peace. It is a place for meeting and gethering, for lectures, sining, music, theatre, dance, sports, dialogue, multilogue in consultation, meditation and mediation. The Earth Charter is an ethical framework for building a just, sustainable, and peaceful global society in the 21st century. It seeks to inspire in all people a new sense of global interdependence and shared responsibility for the well-being of the whole human family, the greater community of life, and future generations. It is a vision of hope and a call to action. More info can be found on the Earth Charter website. On September 25th 2015, the United Nations adopted a set of goals to end poverty, protect the planet, and ensure prosperity for all as part of a new sustainable development agenda. Each goal has specific targets to be achieved over the next 15 years: The Sustainable Development Goals (SDG’s). Do you want to get involved? You can start by telling everyone about them. The UN also put together a list of actions that you can take in your everyday life to contribute to a sustainable future. Irenology is the science of peace and is the counterpart of polemology, the science of war. This component of the Eindhoven Peace Path symbolizes that scientific ways towards world peace are both possible and needed. All forms of arts and technologies -when applied in a peacefull manner- can contribute to World Peace. Experience the power of teamwork. In co-operative games, all players have the same goal. The players win or lose together! Playing a co-operative game is a pleasant and constructive experience. The games show that working together can be just as profitable or even more rewardfull than competing against others. Along the Eindhoven Peace Path a life-sized game of Peace-Chess will be constructed. Here, visitors can play yhe game Metapontum -Peace Chess. Next to the Metapontum, a second co-operative game will be placed. This is an entirely new game that will be custom-made for the Eindhoven Peace Path. The realization of the co-operative games is made possible by a contribution from the Museum voor Vrede en Geweldloosheid. World Peace Flames are a symbol of peace, unity, freedom and celebration. They stand for the essential freedom of the human spirit to create peace at any time under any circumstances – a view endorsed by the millions of people who have lit The World Peace Flame as a symbol of this dream. A World Peace Flame placed in a Wall of Peace forms the radiant centre of the Eindhoven Peace Path. It will not burn in a traditional sense but through a high-tech solution. Ultimately, the Wall of Peace is a universal beacon for peace. On the Wall of Peace, the word Peace can be read in dozens of different languages, making the wall a starting point for World Peace. The Eindhoven Peace Centre Foundation is officially recognized as a Charitative Organization with an ANBI-status. Therefore, your donation to the Peace Centre foundation is completely tax-deductable for you and you are assured that your contribution is spent carefully. Do you have any questions about the Eindhoven Peace Path? Would you like to participate, contribute or register for our newsletter? Please fill out this form or give us a call!